This Smartboard lesson will help students, parents, and teaching staff understand what is annotating and its importance. 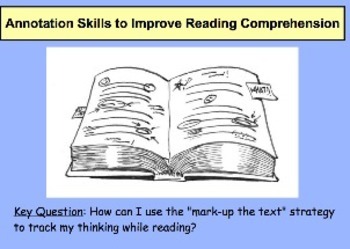 Slides include why we annotate and all the strategies to use before, during, and after reading. 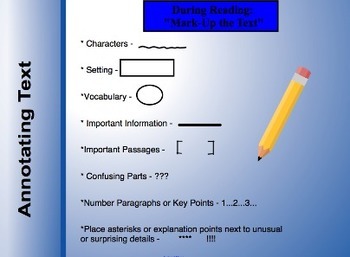 Specific skills are shown on ways to "mark-up a text." Slides also cover how highlighting ideas are not always the best way when making annotations. Slides are shown on what to write in the text margins as well as an example for students or staff to view. Using sticky notes, photcopyng text, and making charts are also addressed in case students can't write in textbooks. The end slides show why it's important to annotate. 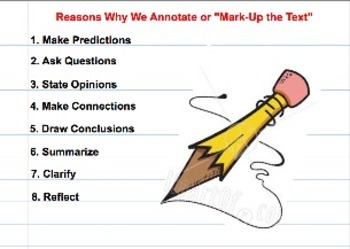 This is a comprehensive lesson for students as well as instructing parents or staff members on the importance of annotating during reading.